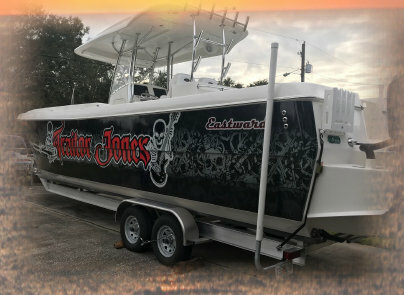 Experience the difference between just buying a boat and having one custom built. Eastward Boats is proud to offer a 30’ power catamaran that has a proven hull design with a long history of providing a smooth dry ride, able to withstand the punishment of extreme conditions. The original design comes from Australia where catamaran style hulls dominate the saltwater boat market due to the rough conditions. 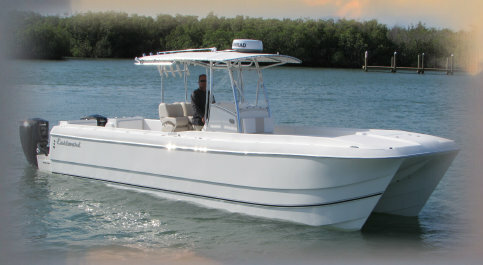 Available in four configurations, center console or cuddy cabins, they have a model that will fit your lifestyle. The hull design incorporates a high bow that can cruise at displacement speed into a steep head sea, something that other cats don’t do very well. The tunnel is also rounded for superior strength and softer landings, when compared to catamarans that have squared off tunnels. This also eliminates stress cracks in the tunnel. The hull measures 30 feet, 3 inches in length and with a 9 foot, 3 inch beam, it’s easy to trailer. Each model is constructed with exceptional attention to every detail, something that you can only get from a boat manufacturer that builds each boat one at a time, custom rigged, to the owner’s specifications. 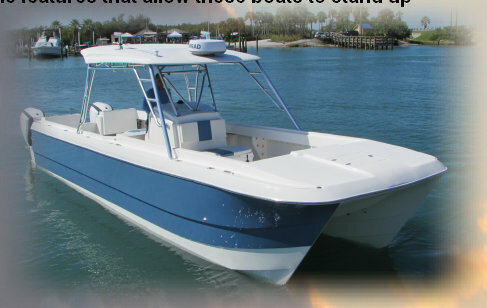 All composite construction, tined wiring, heat-shrunk terminals and S.S. hardware are just a few of the features that allow these boats to stand up to a harsh saltwater environment.